As moms, I think it’s safe to say that we overthink EVERYTHING when it comes to our children—from what they eat to extracurricular activities to disciplining—and, for me, throw adoption into the mix. There's no need to tell you that parenting can be a regular mind melt at times. No matter the age, there’s always something making us question (and question and question) if we’re really doing the right thing by our kids. All this overthinking is not only maddening, but gets in the way of taking action. So, my mom goal of late is this: If my gut says “this feels right”—whether it's following through on a consequence, or jumping into a writing assignment for which I have no idea what I’m going to write—I’ll do my best not to overthink it, but simply to go for it. A logical offshoot of #1, for sure. My daughter is now eight. She has friends and activities and sometimes I wonder if she’d come home on her own if I didn’t say “OK, it’s time to come home now.” With this parenting independence of sorts, I’ve been promising myself that I would make more time for me to actually get together with my girlfriends instead of only talking about it, or step up my freelance work, or get involved with projects that speak to my soul. Right now…I am scheduling a dinner date with my best friends, I am helping to produce a show called Listen to Your Mother, and I accepted two freelance assignments. I know I can definitely do more to invest in myself, yet I am happy that I have begun. None of the above can take place without making the head- and heart-space to do a little nothing every day. But this is a hard one. This is the one that kicks my stay-at-home mom guilt into high gear. How can I possibly soak in the tub with a trashy novel, or sit down without at least folding laundry, or make dinner plans with friends when I said YES to two writing gigs and producing a show? Plus, I have to get to Trader Joe’s today because tomorrow I have to spend the morning stuffing the cat into the cat carrier to take him to the vet for his checkup and then take my daughter to Tae Kwon Do! Now what? Well, what I know (and what I have to keep reminding myself) is that my writing comes easier when I take a break. That the hour I spend working out helps me sleep better at night and I like the way my arms look. I also know that things come up unexpectedly and there are always going to be those times when we have to push through. And if I can’t take an hour for a hot bath, then a 15-minute shower with classical music can work just as well. There are also times where we can ask for help, or an extension, to bring us a little peace of mind. But I think that, if we know that cultivating downtime is a worthy goal, then we moms will somehow find a way of making it happen. Thank the blogger or mom who tagged you and link to her blog. List 10 (or more, or less) things you believe make you a good mother. 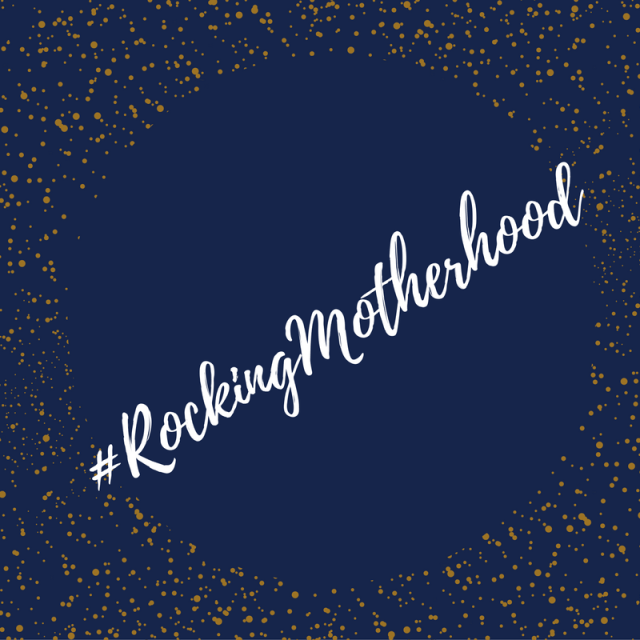 Tag 3-5 bloggers or moms to join in the #RockingMotherhood Challenge.